Here is where the shenanigans come into play. 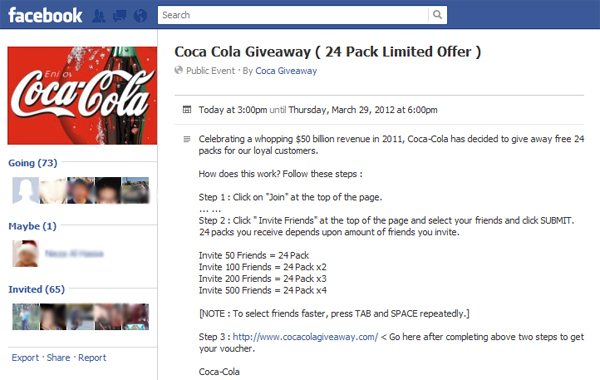 You are required to join the event, and invite your friends – notice the more people you invite the more Coke you get. Obviously a ploy by the scammer to dupe as many people as possible. 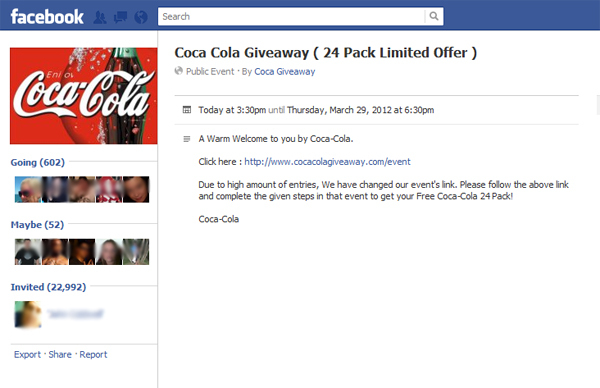 If you did make the mistake of joining this bogus event, then you should remove yourself as an attendee. Also, if you invited your friends, then you should let them know that the event isn’t legitimate and that they should ignore the invite. As with other offers that sound too good to be true, always verify online promotions with the company. Don’t be tricked by bogus offers and marketing gimmicks!